After a couple of months of endless spiritual questions by our second son, Lincoln, and hopefully wise answers from his parents, he decided to surrender his heart to Jesus Christ, his Lord and Savior. 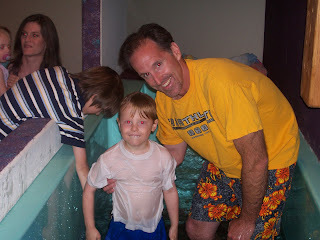 He was excited and determined to follow with baptism at our new church in Queen Creek. He bravely told the pastor about his conversion, and for the rest of the following week we practiced baptizing in the tub so he wouldn't be afraid. On Palm Sunday he was baptized in the frigid waters at Calvary Chapel. We were all very happy and celebrated with family at Barro's Pizza!